More and more we’re seeing simplistic portrayals of Josephine County as a rural backwater and “resource/timber dependent” community. It is neither. The reality if far more complex. A small part of the Asante – Three Rivers Hospital campus in Grants Pass, the county seat. Josephine County is a mix of well-to-do neighborhoods and enclaves of half million dollar plus mini-estates—often adjacent or near federal public lands—and extreme poverty. Neither the poverty or wealth are a result of resource extraction or timber or mining jobs. In fact, when the cut coming off the National Forest and BLM lands in the County was at its lowest, the economy of Southwest Oregon and Josephine County was booming as never before. What hit Josephine County is what hit the rest of the nation—the bursting of the housing bubble and the financial crisis of 2007-09— and almost brought down the global economy. 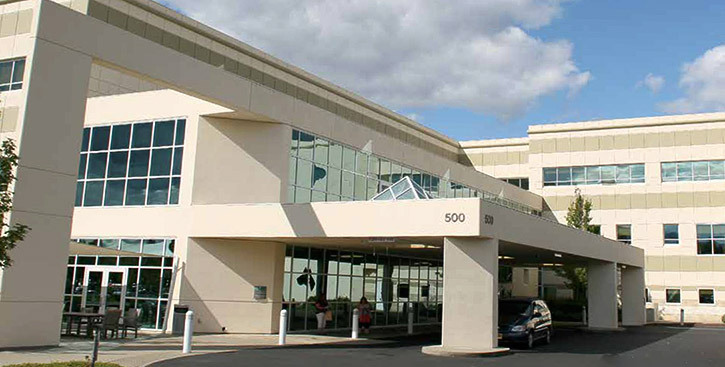 One only has to look at the growth of the Asante-Three Rivers Community Hospital Campus that recently opened a 90,000 square foot outpatient center that is reported by the Medford Mail Tribune to have cost $30 million. was the feature story in the June 2, 2016 Reveal, the online publication of the Center for Investigative Journalism. In 2004 Fortune Magazine found Grants Pass, which is by far the largest population center in Josephine County, one of the top five places in the nation to retire in. The mild climate, fishing, whitewater rafting and the health care facilities were listed as the reason for the high ranking. Logging and mining were not on the list. According to which extraction-related interest group one talks to, the resources that the County’s economy is dependent on are solely the timber and minerals found on the surrounding National Forest and Bureau of Land Management lands. A closer look at the real Josephine County and it’s economy would reveal a much more complex story than the recent article on Reveal News, the website of the Center for Investigative Reporting. The article title, “In the rural West, citizens chose low taxes over law enforcement,” is true of Josephine County, but of other rural counties in Oregon as well—albeit Josephine County has the lowest tax rate of all. But the sections on the Northwest Forest Plan and the O&C Lands come straight from the timber industry’s playbook. Nor is the the plethora of expensive homes in surrounding rural areas on five-acre mini estates, or the high end subdivisions surrounding pocket of Public Lands like Cathedral Hills Park and Trail System. However, according to EPA the metal mining industry is the largest source of toxic pollution in the nation and if there was any such thing as free lunch from the logging our National Forests, we ate it long ago. But industry groups wanting access to the trees and minerals—either for free or bargain basement prices—are masters at spin. They relentlessly use the lack of law enforcement and the impoverishment of certain segments of the County as excuses to gain control over what are in fact our heritage lands—lands which are held in trust for all Americans. The real economy of the area is much more complex and nuanced and the causes of the County’s economic woes are not as these interests would have them. The truth is, it’s been at least two decades since Josephine County could be described as timber dependent and over a century since hardrock mining contributed much, if anything, to the local economy. Reduced logging on federal lands from implementation of the Northwest Forest Plan is often blamed the area’s for high unemployment. This is simply not true. Unemployment was at its lowest in 35 years in 2000 when very little timber was coming off public lands. Contrary to the rhetoric of timber industry supporters, the economy of Josephine County boomed in the wake of the Northwest Plan. In 2000 unemployment was at its lowest since 1958. What sent unemployment through the roof in Josephine County was the financial crisis of 2007-08, It was part of a complex set of ailments that crashed the booming economy of the Oregon, the nation and the world in the previous decade. Other factors playing into the County’s specific economic woes were the bursting of the housing bubble, opposition of powerful players like the O&C Counties and timber industry to a permanent fix for county funding when there was a federal budget surplus, and the lowest property tax rate in Oregon. 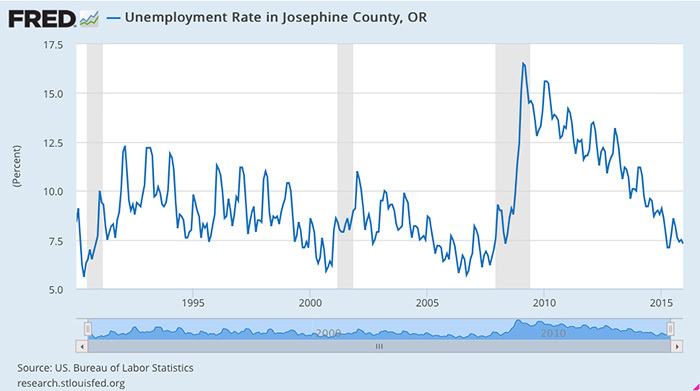 Unemployment in Josephine County went through the roof not in the wake of reduced logging on federal lands but following the burst of the housing bubble and the 2007-08 financial crisis. The gray bars on the graph are recession periods. Click on the chart to go to the original source. In a little more than a decade the Grants Pass area has gone being one of Fortune Magazines top 5 places to retire in 2004 to a county that is known for setting free jailed prisoners, lawlessness and armed militia types. But you can still drive around Josephine County and find huge homes, gated drives and plenty of wealth. It’s just more convenience for the media and some politicians to blame reduced logging on federal lands and the lock up of so-called mineral wealth. 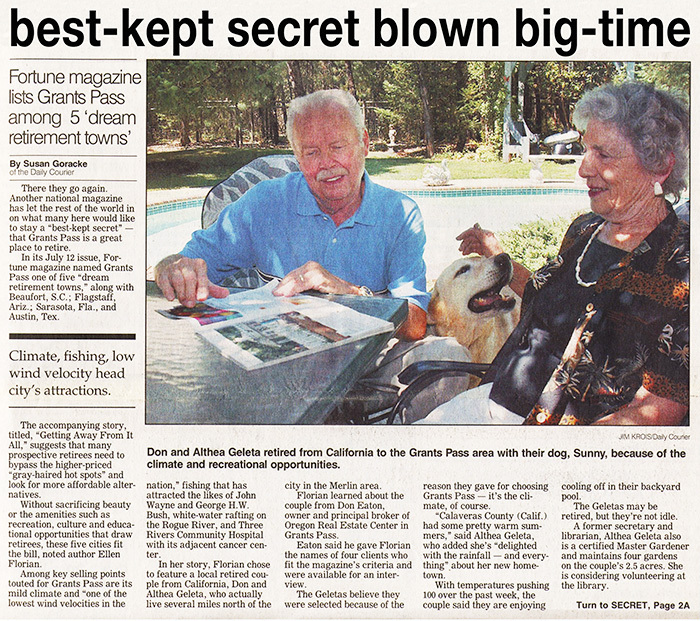 In 2004, Fortune Magazine named Grans Pass one of the top 5 places in the nation to retire to. Attractions mentioned were: the mild climate, fishing, whitewater rafting and the area’s health care facilities. Logging and mining did not make the list. However, instead of going into a decline when the Northwest Forest Plan reduced logging on federal lands to protect other values like salmon and clean water, the economy of Josephine County, like most of the rest of Oregon, boomed as never before. Unemployment was at near record lows—until the financial crisis in 2007-08. 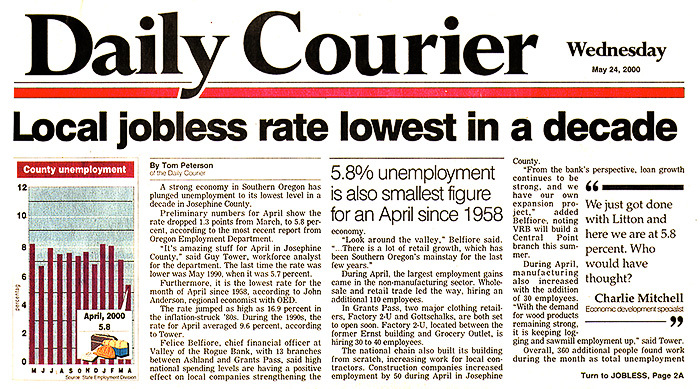 Prior to thatt he Grants Pass Courier was full reports of rising property values, new construction and designer homes. 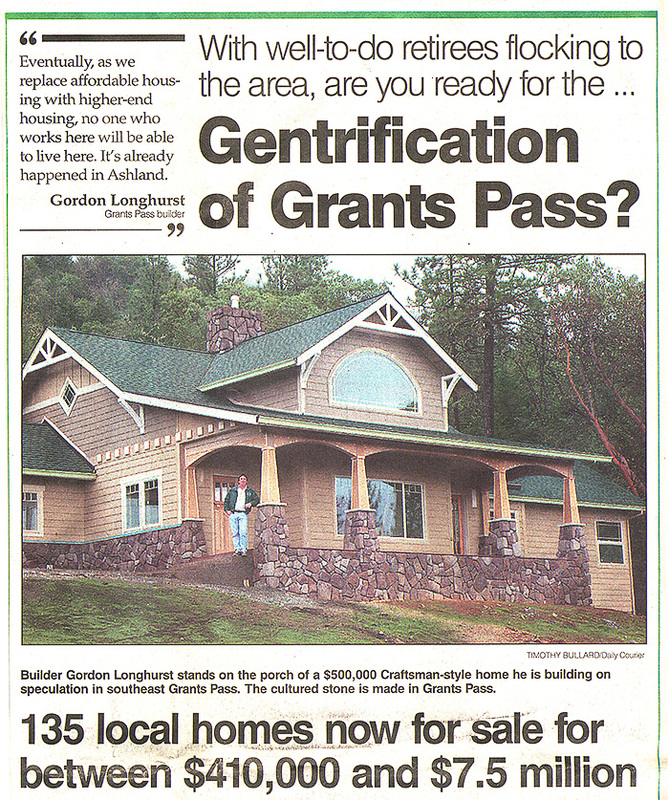 Real estate developers and the paper boasted about the “gentrification” of Grants Pass and number of custom homes for sale between a half million and $7 million. The Grants Pass Courier was full of articles about “the gentrification of Grants Pass.” Drive around today and you’ll find pocket of extreme wealth and extreme poverty in Josephine County. Headwaters Economics provides us with tools to examine the local economy and demographics. Below are a few facts from the profile they ran for Josephine County. You can download the full socioeconomic report here (451 kbs). From 1970 to 2010, personal income in Josephine County grew by 256% compared to 201% for Oregon as a whole. From 1970 to 2010, population in Josephine County grew by 128% compared to 83% for State of Oregon. From 1970 to 2010, labor income grew from $460.7 million to $1,102.1 million (in real terms), a 139% increase. From 1970 to 2010, non-labor income grew from $248.5 million to $1,425.7 million (in real terms), a 474% increase. In 1970, non-labor income represented 35% of total personal income. By 2010 non-labor income represented 56% of total personal income. Between 1990 and 2011 unemployment remained relatively low until the 2008 recession (see graph above). From 2001 to 2010, the three industry sectors that added the most new jobs were health care/social assistance (1,590 new jobs), finance, insurance (531 new jobs), and real estate, rental, leasing (412 new jobs). In 2010 the three industry sectors with the largest number of jobs were health care/social assistance (5,537 jobs), retail trade (5,145 jobs), and manufact. (incl. forest products) (3,767 jobs). Note – Non-Labor Income is defined as: Dividends, interest, and rent (money earned from investments), and transfer payments (includes government retirement and disability insurance benefits, medical payments such as mainly Medicare and Medicaid, income maintenance benefits, unemployment insurance benefits, etc.) make up non-labor income. On August 17, 2013, in an extended sit-down discussion with the editorial board of the Salem Stateman Journal, Congressman Peter DeFazio explained the strategy of the timber industry and Association of O&C Counties in the wake of the Northwest Forest Plan.